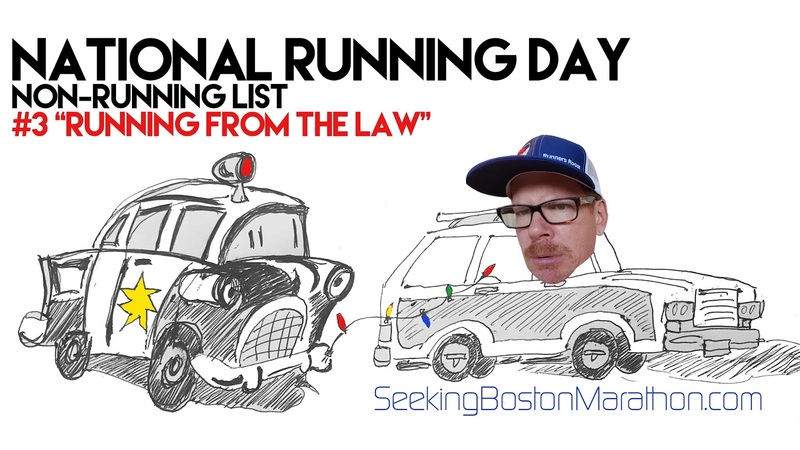 It's National Running Day today. I'm a devout running addict, and I can't run right now. I'm still rehabilitating my torn hip labrum with some pain that still can't be ignored. Even my P.T. on Monday looked at me with her, "you must be kidding face"when I started to talk about when I might be able to run again. Five out of the last twelve months have been on the bench without running. "Game time decision" for another week. With all that, I can't NOT participate in the day. With that, my top ten non-running running list. 2) Run in my stockings. No, I'm not Caitlyn Jenner, and no I don't wear stockings (as far as you know), but I do wear socks. I hate to throw out my favorite pairs; they just find their way to the bottom of the bin. 3) Running from the law. I won't post all my transgressions. I don't like lawyers until I meet the one with my long-lost relative oil well settlement proceeds. My most famous or infamous was in Jr. High when Tony McCurty and I "borrowed" his mom's station wagon. Neither of us were old enough to drive and Arapahoe County's finest pulled us over as suspects in some Christmas light vandalism nearby. My parents were called to pick me up behind the King Soopers grocery store convinced it was my brother Todd who was picked up by the cops again. 4) Running on empty. This explains most of my miles 20-26.2 and the 48 hours leading up to the 2015 Boston Marathon. 5) Running for office. I ran and was voted vice president of my class in grade school. I also ran for "little sister chairman" of our fraternity. Another successful post tainted by the "Red Feathers Lake Little Sister Retreat." We ran out of firewood and the party burned the kitchen furniture in the fireplace. We didn't get the damage deposit back. 6) Running man. The quintessential white guys dance. I am the "poster child" for white guys who can't dance. My body moves one direction and that's forward. 7) Running water. Our house has running water but my kitchen does not. A broken kitchen spray nozzle lead to a trip to Home Depot. The job is half done as I head out of town. A plumber I am not. Qdoba for the next three days for the teenage boys or cleaning dishes in my hot tub. 8) Leave the car running. It's illegal in Colorado, but on frigid winter mornings you'll find fumes of gray smoke billowing out of many a car trying to warm up for the drive. 9) Imagination running wild. You don't want to look into the psychedelic kaleidoscope that is my mind. My vivid imagination keeps me young and spinning stories off these pages. 10) Running out of time. I have run my favorite race five times. I don't have a BQ for 2016 which is the first time since 2009. Injuries and the calendar are working against me, but I'm determined to run it again. 2017!